In 2012, 2014, and 2016, I was elected by my peer board members in Region 10 to serve on the TASB Legislative Advisory Committee to collaborate with delegates from all regions in the state to set the legislative platform for which TASB will advocate to the state legislature this session. In 2014/2015, I was one of 36 board members in Texas to be selected for inclusion in the Leadership TASB class, a leadership development program that provides specialized training for experienced board members. The year-long program consists of five weekend sessions lasting two-to-three days each, rotating among different Texas cities. Nationally-known speakers and experts in education and business address themes such as teamwork, trusteeship, equity, diversity, and visionary leadership. Sessions include visits to successful schools and innovative programs. Participants build relationships with colleagues from around the state while discovering solutions for today’s public education challenges and learning how to address the challenges the future is expected to bring. 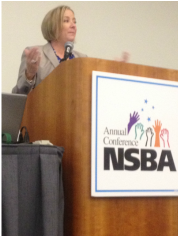 At the April 2013 National School Board Association annual conference in San Diego, four trustees (myself, Tammy Richards, Marilyn Hinton, and Mike Friedman) and Mark Allen, the Executive Director of Student and Family Services from Plano ISD delivered a 90-minute presentation about Character Education. We appreciated the support of Superintendent Richard Matkin and several cabinet members (Cathy Galloway, Patty Meyer & Karla Oliver), as well as fellow trustees David Stolle and Carrolyn Moebius to show their support. Participants said they received great "take-away ideas" from the session and were inspired to implement some of these character education initiatives in their districts.